Jal Mahal Jaipur also known as Water Palace is considered as one of the most beautiful architectural palace that was built with the Mughal and Rajput craftsmanship. 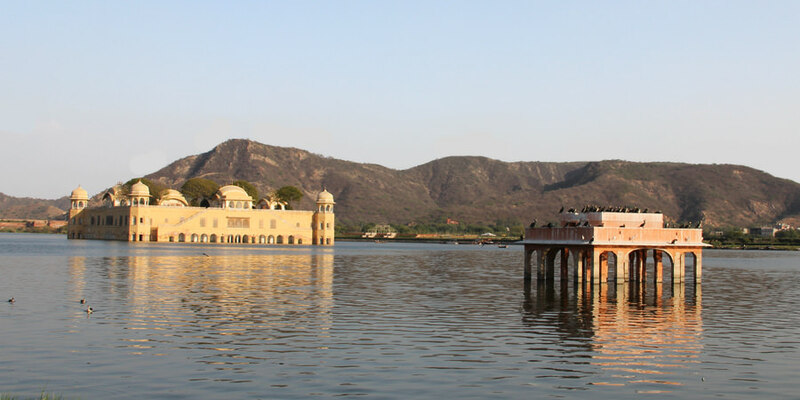 Jal Mahal palace provides a charming view of the Man Sagar Lake and the Nahargarh hills that border it. It is considered an architectural beauty built in the Rajput and Mughal styles of architecture. The boats are traditionally built by boat makers of Vrindavan and a ride to Jal Mahal in those boats takes you to the beautiful history of Rajasthan. Jal Mahal which literally means the “Water Palace” is a palace located in the middle of the Man Sagar Lake in Jaipur city, the capital of the state of Rajasthan. 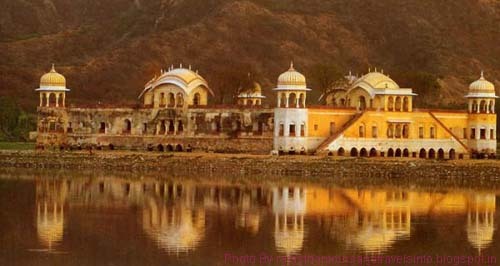 The palace and the lake around it were modernized and enlarged in the 18th century by Maharaja Jai Singh II of Amber. Jal Mahal, that means water palace in English, is a beautiful place that is located in the center of the lake Man Sagar, in Jaipur. Jal Mahal Jaipur is made of red stone and is 5 stories high. The 4 floors of the palace stay under the water and it is only the 5th floor that is visible. There are 4 chattris on all the four corners of the palace. These are octagonal in shape. 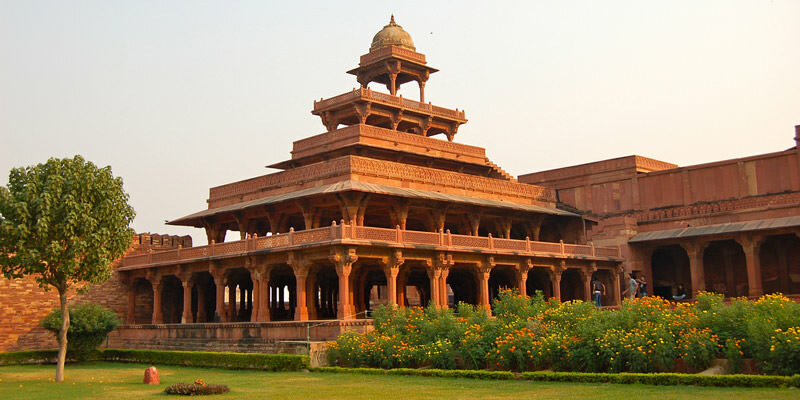 The fort has some of the exquisite marble carvings which denote the royal touch and the palace also has twenty pillars which are the cenotaph of the royal family of Raja Jai Singh. The lake, as well as the place, was renovated by Maharaja Jai Singh 2 in the 18th century. During the rainy seasons, the city lake gets filled up with water. The water palace is open only through boats that take the tourist from the land to the palace in the center of the lake. Even while crossing the palace for the road, the whole view looks very charming that it attracts people of all ages. The lake used to be a bird watcher’s paradise in the past and was a favorite ground for the Rajput kings of Jaipur for royal duck shooting parties during picnics. The lake was home to more than 150 species of local and migratory birds that included Large Flamingo, Great Crested Grebe, Pintail, Pochards, Kestrel, Coot, Redshank, Marsh Sandpiper, Ruff, Herring Gull, Red-breasted Flycatcher, Grey Wagtail, but their numbers declined with the worsening of the lake. The reserve forest area of the lake catchment has several wildlife species such as Deer, Jungle cat, striped hyena, Indian Fox, Indian wild Boar, and leopards. 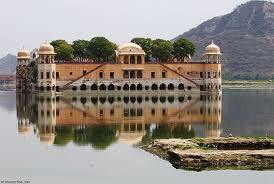 Jal Mahal Jaipur is one or the sites which tells the story of the royals and their exclusive taste and creations. 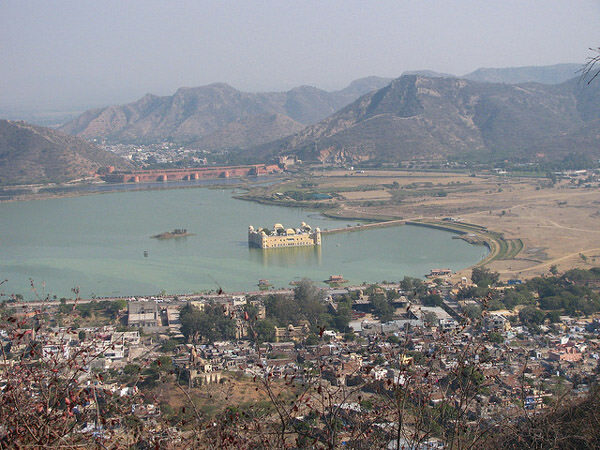 Jal Mahal is located about 4 kms from Jaipur main city center and can be reached via Jaipur-Delhi National Highway. Entry Fees and Timings: Visitors are not allowed to enter the Palace. But you can enjoy the view of the palace by boating in the lake. Jal Tarang is the 100 acre mixed-use tourism development in the city of Jaipur, marks a public-private partnership like no other in India. It is a dream project that brings together the best resources of the Government of Rajasthan and Jal Mahal Resorts Pvt. Ltd. to revitalise the heritage site of Jal Mahal Jaipur and the rich natural resource of Mansagar Lake and transform the valley into a vibrant and viable destination for local, domestic and international tourists. In doing so, Jal Mahal Resorts is powered by the vision and expertise of eminent and qualified professionals in various fields from all over the world, and the resources and commitment of the government of Rajasthan. wish I could go inside the palace and can see the chameli bagh of Jal Mahal.. also wants to see the beautiful mountain view from the middle of the lake..
jal mahal is quite good place to hangout but poor maintenance make that place dirty, water is also not clean. you can’t go inside of water palace but good place for photography and can buy jaipuri chappals and other rajasthani traditional stuff. interested to see beautiful inside photos of jal mahal jaipur.